Never say never to fashion trends.. I didn't like slip on shoes for some time. I thought they are really awful. Absolutely. But in fashion it's never say never. So I decided to buy platform slip on shoes by Topshop. And it's definitely good alternative to high heel shoes and it's perfect for weekends...But before they were in the list of ugly shoes for me. Какая шикарная юбка!))) Красный с денимом прекрасная компания! Отличный образ! Слипоны действительно классные, особенно для долгих пеших прогулок! The slip ons are for real a great buy, Irina! 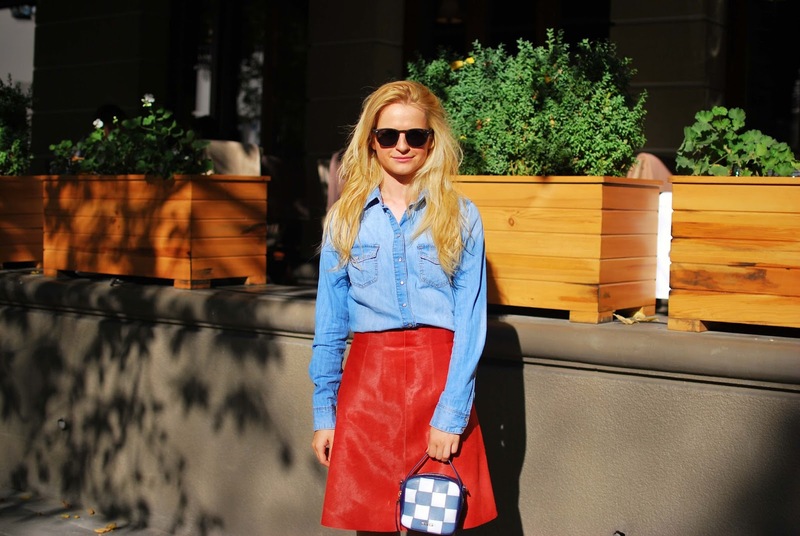 Love how you styled this amazing leather skirt, casual yet chic!